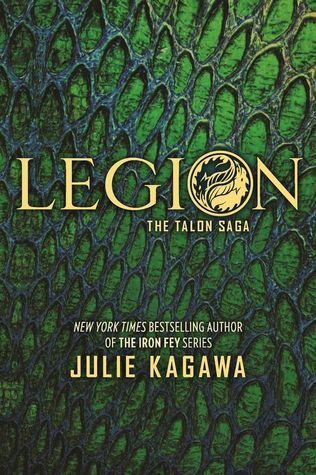 Legion by Julie Kagawa is the third book in the Talon Saga. 1. I put off reading this book for almost a year. It really has been sitting on my shelf since it came out. I as just worried about the fate of Garret, but quick spoiler that happens in the first chapter, Garret lives. So this book picks up right where Soldier ended. This book also gives more Dante chapters than the previous books. 2. Kagawa uses is book to set up for the ending of the series. In this book, Kagawa reveals not only Talon's plans in this book, but why the Elder Wyrm wants Ember so badly. 3. So, I just need a minute to talk about Garrett's near death at the beginning. I was dying a little on the inside as Ember held him crying. Then, when Riley stepped in to save him, wow, I was a little amazed. That leads to so interesting results with Garrett as the book progresses. 4. Ember has some interesting developments in this story. She finally comes to terms with her dragon. Both the girl and the dragon declaring their loved for Garrett. And now, they are not fighting each other for control. 5. I interested to see where Kagawa is going to take the series finale. One thing is I wonder what side Dante will landed on in the end. There is so much going on that he still does not understand about Talon. Plus there are hints of a war possibly brewing within Talon itself.